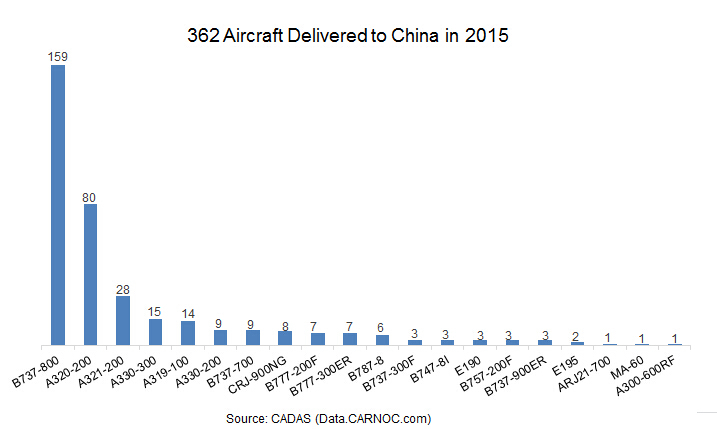 Chinese carriers have taken delivery of 348 passenger planes and 14 freighters totally in 2015, including 40 wide-body aircraft, 293 narrow bodies and 15 regional jets, according to CARNOC fleet data base CADAS. The 362 new aircraft delivered in the past 12 months consist of 159 Boeing 737s, 117 A320s, 15 A330-300s, nine A330-200s, nine 737-700s, eight CRJ-900NGs, seven 777-300ERs, seven 777-200Fs, six 787-8s, three 747-8Is, three 737-900ERs, three 737-300Fs, three 757-200Fs, three E190s, two E195s, one A300-600RF, one ARJ21-700 and one MA60. China's four major airlines accounted for a large proportion on the new aircraft introduction, in which China Eastern took the top spot with the introduction of 65 new aircraft from Jan.-Dec. 2015, followed by Air China (36), China Southern Airlines (34) and Hainan Airlines (30). 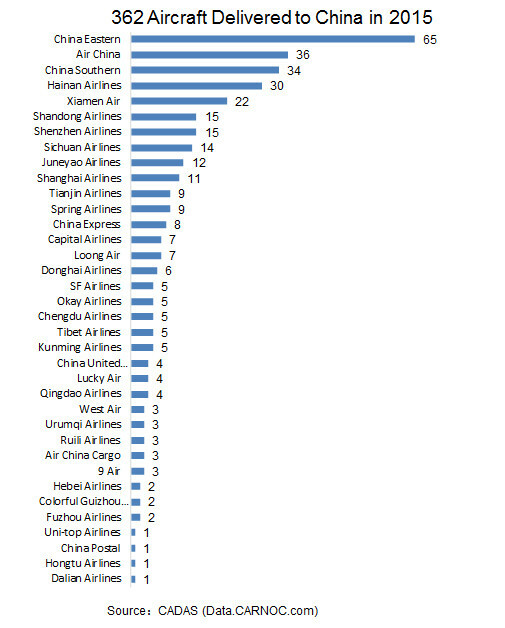 Among the commercial aircraft delivered to China in 2015, there are 293 narrow-bodies, 40 wide-bodies and 15 regional jets. 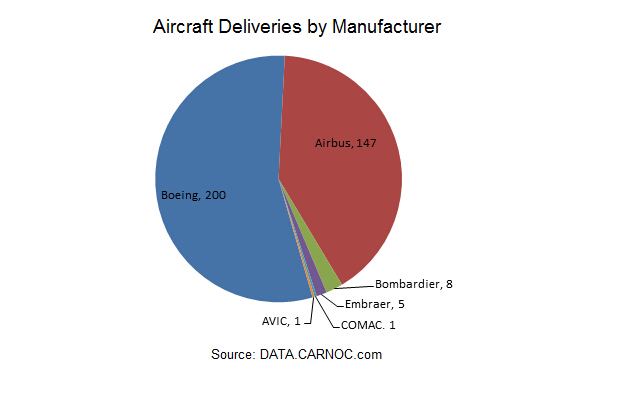 Specifically, Boeing and Airbus took up nearly 96% of the total airplane deliveries, with 200 and 147, respectively; while the rest 4% came from regional jets delivered by Embraer, Bombardier, COMAC and AVIC Xi'an Aircraft Industry. In terms of cargo planes, there were eight wide-body and six narrow-body converted freighters delivered to China in 2015. In December 2015, 20 Chinese carriers including Air China and China Eastern Airlines have taken delivery of 38 new passenger and cargo aircraft totally, including 21 Boeing 737s, 11 A320s, two E195s, two E190s, one A330-200 and one 777-300ER, according to CADAS database. 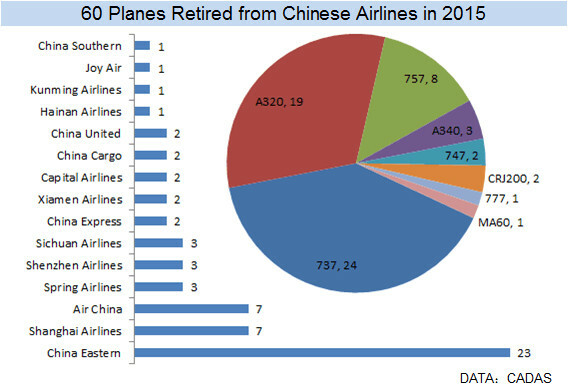 Along with fleet expansion, Chinese airlines also retired some old aircraft. According to CADAS, a total of 60 commercial planes were phased out of service in 2015, including 24 737s and 19 A320s. Note numbers above excluded aircraft that were transferred to other air operators.